Airspace stern tube seals are a four-ring sealing system that has a dedicated air chamber. Sea water and sterntube oil are kept completely separate, which increases the durability and longevity of the stern tube bearing. At the same time, oil is completely unable to seep out into the ocean. These stern tube seals are approved as a non-pollution seal by the leading classification societies. 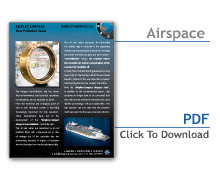 Contact us to learn more about airspace stern tube seals provided by Simplex Americas.